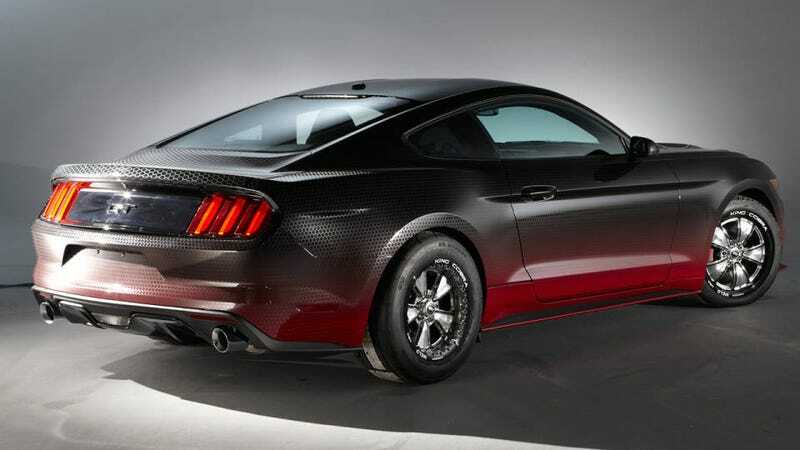 Yes, the King Cobra is basically all three of Ford Racing's major parts packs screwed onto the 2015 Mustang GT. But there's more to it than that. We spoke to Ford Racing's Jesse Kershaw to answer some burning questions we had about the big snake. This is what we found out. 1. Can you buy that wrap? 2. You mentioned at SEMA that the car was fitted with a prototype off-road exhaust. Can customers buy that from Ford Racing? 3. If the exhaust's not street-legal, what would a streetable King Cobra be able to do at the strip? 4. Is there anything else on the King Cobra that won't be available to customers? 5. What's the story with the King Cobra's tires?